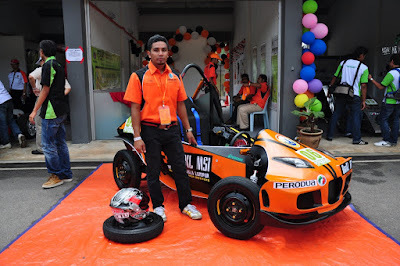 On 25 June 2011, the third installment of Perodua Eco-Challenge (PEC) 2011 had taken place at Melaka International Motorsports Circuit. This year, PEC had brought a new challenge to thirteen selected higher learning institutional when they have to construct their own design and engineered their own car while engine and transmission were provided by Perodua. The main objective of the PEC 2011 is to provide a training ground for undergraduates to challenge their engineering prowess and to promote innovativeness among local students. The challenge is to build a car powered by a 660cc 3 cylinder engine. A transmission and an ECU were also provided. In addition, Perodua also gave RM17 500 development fund to all the participating teams. The PEC 2011 falls into 3 categories. The main category is Longest Distance where the cars have to be driven on circuit until it completely stop. 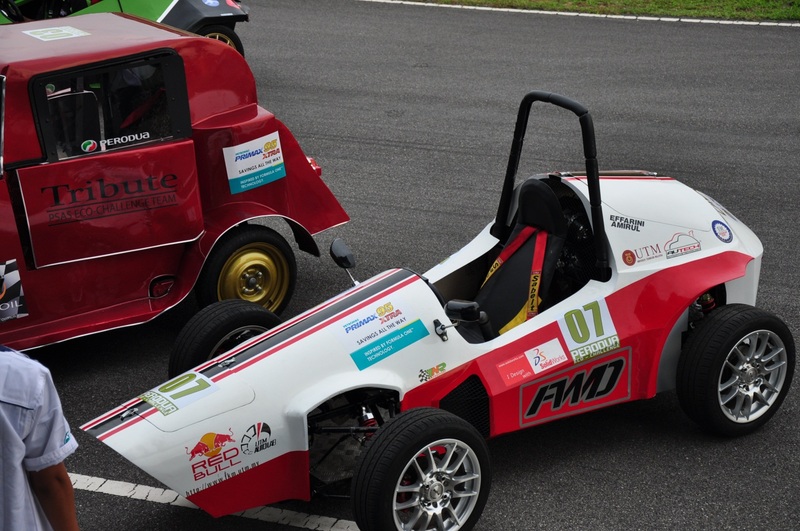 0.5liter fuel was provided to run each car. The winner of this challenge was selected based on the longest distance a car can be move with the least amount of penalties. The other two categories are Engineering and Design where the winner was selected based on the booth presentation on the engineering and design aspects such as framework, aerodynamics, visual and etc. As can be seen in the pictures below, there are a lot of creative car designs produced by our local undergraduates in this challenge. All of this team has come out with a unique car design with different engineering capabilities. A great effort had been shown by all the participating team members while the supporters of every team also play into roles to make the event more exciting and memorable. Now, let’s take a look at one of the participating team in this PEC 2011, Universiti Teknologi Malaysia (UTM). It is an honor for our company and SolidWorks when we are able to sponsor one of the PEC team (UTM team) which consists of young future engineers and inventors in order to accomplish our social responsibility for the nation. It is in line with our company vision which to provide the best CAD/CAM/CAE solutions throughout this region. Our Product Manager, CW Lau went to Melaka to give moral support to the team on the event day and see by himself the car produced by the UTM team. This is the Calamaro designed by the UTM team where had fully utilize SolidWorks in its design and development. The mechanical structure of the car chassis was designed using 3D CAD software, SolidWorks and not only that; UTM had also make use of CAE in SolidWorks by coming out with the bending analysis of the structure using SolidWorks Simulations. UTM team realizing the workability of the car in term of engineering and design by providing flow analysis results which also using the SolidWorks Flow Simulations. Using SolidWorks as the backbone of CAD and CAE for this car engineering and design, UTM can proudly claim themselves as the winner of Engineering category and second runner up of Design category. SolidWorks is not only can be used for mechanical design purposes. 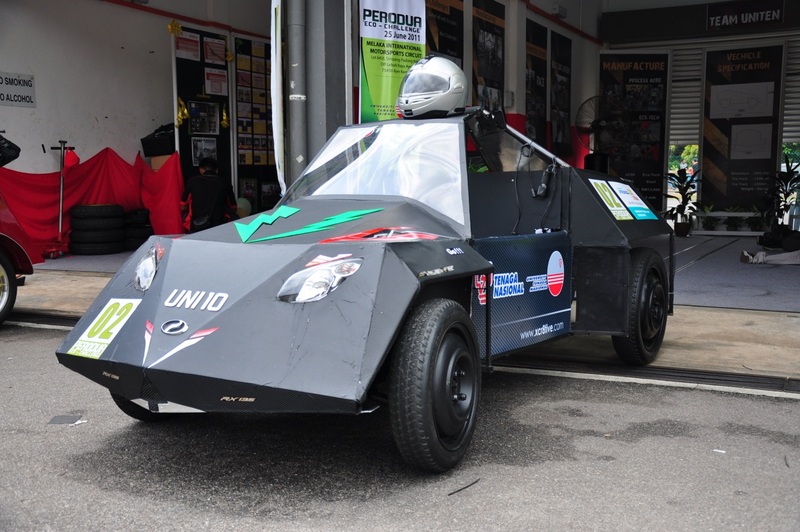 As you can see in the PEC 2011, UTM had provided us with a very good example of how we can extend our design a step further. By using SolidWorks 3D modeling software as a platform, UTM had use the SolidWorks Simulations to perform Finite Element Analysis to analyze the impact of the force load to the structure of this car. Taking the bend analysis result of the car frame as the medium to interpret the strength of the car to withstand the gravity, engine weight, suspensions and the human weight body; it can be said that the main objective of UTM team on making a car with lightest frame without sacrificing the strength of the frame had successfully achieved. UTM also put the car design concept into serious consideration when the team came out with four different concepts of design. In order to select which design is the best design to be produced, the team had tested all the conceptual design using SolidWorks Flow Simulations. This way, the team has early prediction on the dynamicity of the car’s design which contributes to the lower production cost as the team just need to fabricate the real car based on the best calculated prediction provided by the aerodynamics analysis of SolidWorks Flow Simulations. With the help of this two amazing CAE tools provide by SolidWorks Corporation which fully integrated with SolidWorks 3D CAD software itself, time had been save a lot when there is no need to transfer the model into other CAE software. The cost of unnecessary modification is also being reduced as all the results of the car engineering had been predicted earlier which also contribute on reducing the time of fabrication. In total, this Calamaro produced by UTM undergraduate team had shown SolidWorks can be a total solution provider for your design purposes. The simplicity and highly user friendly software succeed in moving the team a step forward. 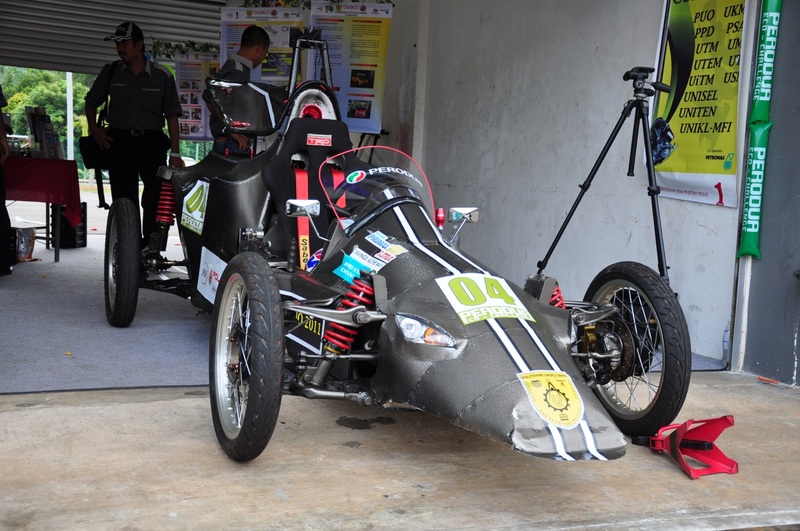 It is indeed a fair competition for UTM when the team is able to convince the judges of how they engineered the car. Huge efforts had been done by these undergraduate students and a 200% commitment should be given praise. In general, the PEC 2011 teams which consist of 20 undergraduate students work in a team lead by two lecturers as advisors had succeed in proving to Malaysia that our local universities can be as creative and as motivated as the global undergraduates. All needed is a pump of adrenaline by the local companies in Malaysia to support them into realizing their dreams. It is hope that in future, more companies will be hand in hand in organizing other competitions to create more local experts in technical area within various industries. Cool! SolidWorks & IME ROCKS!!! !